The Golden Buddy Champion Box is finally on sale last Friday! Have you got your set yet?! As promised, we’re bringing you the final arc of The Golden Triad series where we’ll review Kyoya Gaen’s Dragon Zwei deck. Dark Luminize, Wings of Demise! Bring an End to the World with The Demonic Dragon Deck! 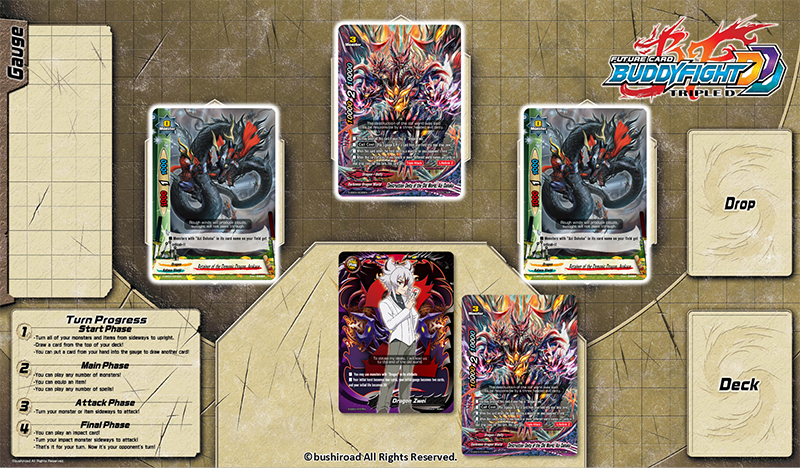 “End of the World” is a new deck that Kyoya Gaen has created using “Dragon Zwei”. In exchange for being able to use only Monsters in your deck, you start your fight with 20 Life! The main attackers in your game will be Size 3 Monsters such as “Destruction Deity of the Old World, Azi Dahaka”, with defense support provided by Monsters that are Size 2 or less. Wait for the perfect moment to strike! “Destruction Deity of the Old World, Azi Dahaka” activates its Triple Attack ability when you have cards with 6 or more different World names in your Drop Zone, so look out for this moment to strike! 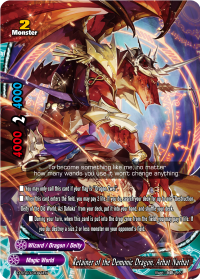 Until then, bolster your defense by calling “Retainer of the Demonic Dragon, Fallen Wing Dragon” to your center, or use “Retainer of the Demonic Dragon, Hadron” to change out cards that are not needed and increase your gauge. Bring the end to everything with “Triple Attack”! When you have cards with 6 or more different World names in your Drop Zone, it’s time to bring forth the end! 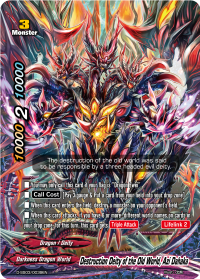 Call “Destruction Deity of the Old World, Azi Dahaka” and defeat your opponent with “Triple Attack”! Also call “Retainer of the Demonic Dragon, Arakaze” to the field, to give Azi Dahaka an extra critical to win the game! 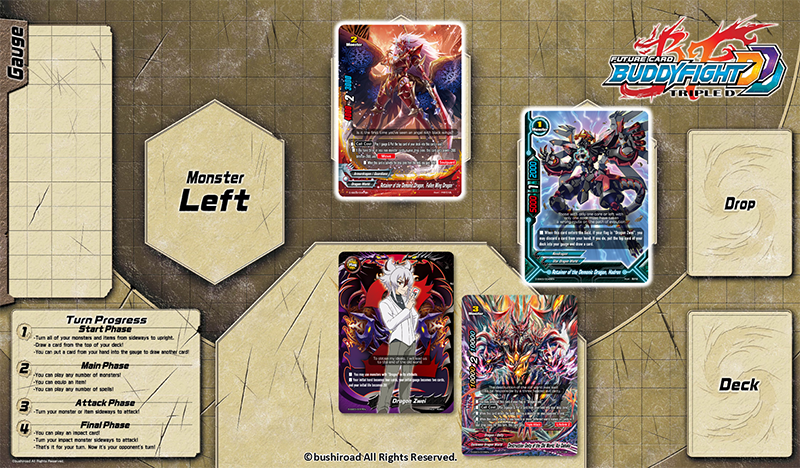 Here are some of the key cards from Kyoya’s End of the World deck! This card can be used to find “Destruction Deity of the Old World, Azi Dahaka” from your deck and place into your hand! On top of that, when it leaves the field you get to destroy a Size 2 and below Monster from your opponent’s field! 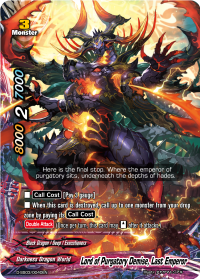 With its “Double Attack” ability, “Lord of Purgatory Demise, Last Emperor” shall be one of your main attackers! What’s more, when it is destroyed, the Last Emperor can be used to call a Monster from your Drop Zone onto the field! As this fearsome Azi Dahaka enters the field, destroy a Monster on your opponent’s field! On top of that, when you attack and have cards with 6 or more different World names in your drop zone, it gets “Triple Attack”! This supreme power is as expected from this three headed evil deity who destroyed the old world! That’s a wrap, folks! We hope you’ve enjoyed this article series, and you have fun playing these three strong decks from the Golden Buddy Champion Box! Some cards that can be used to power up these pre-constructed decks are included in the Triple D Booster Pack Vol. 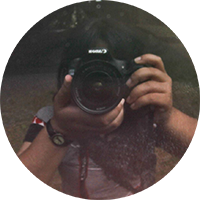 4: Shine! Super Sun Dragon!! releasing this December 23rd, so make sure you get your hands on them as well! We’ll be back with more card reviews and event updates, so stay tuned to Buddyfight Buzz! Till then, keep on Buddyfighting!